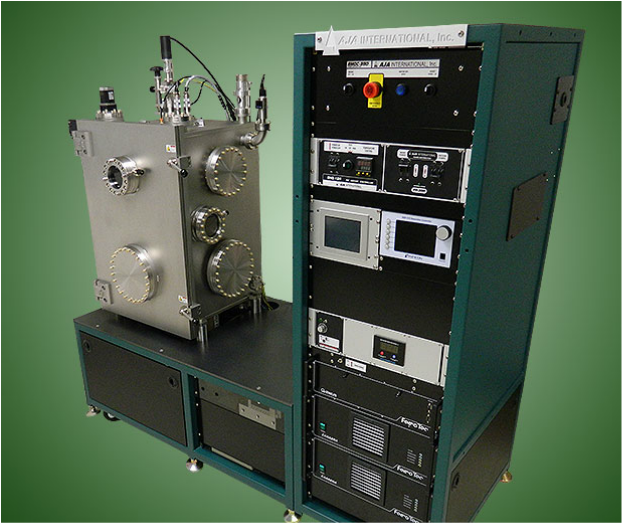 AJA International ATC-E Series Electron Beam Evaporation Systems are available in the following versions: ATC-E and ATC Orion-8E cylindrical, UHV style chambers, and ATC 2030 and ATC 2036 HV style box coaters. 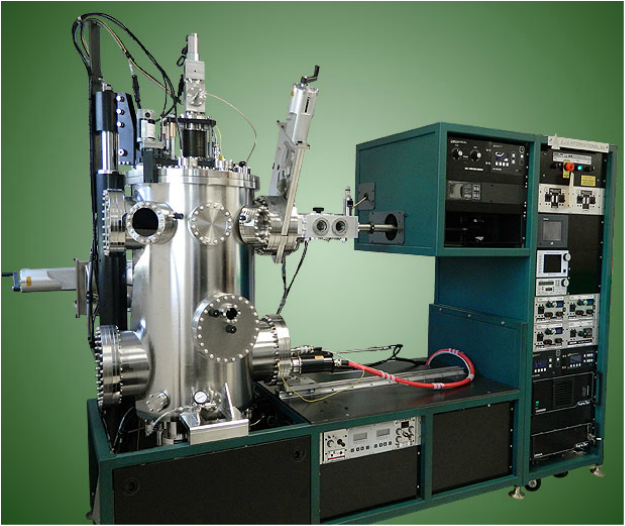 These physical vapor deposition systems offer exceptional value while delivering optimal performance and utilizing top quality sub-components. 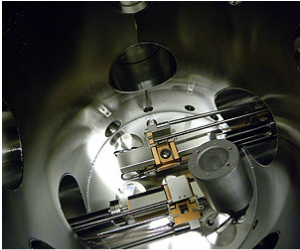 They inherit many design features and common parts from the highly evolved ATC & ATC Orion sputtering tools and can be outfitted with single or multi-pocket linear and rotary e-beam sources, thermal evaporation sources, ion / plasma sources, Knudsen cells, low temperature evaporation cells for organic materials, Radak Sources, and magnetron sputter sources. In addition, these systems are available with load-locks, QCM monitoring and control, heated or cooled substrate holders, planetaries, various pumping packages and automated control. 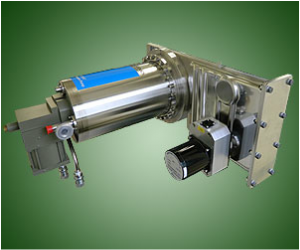 Compact, economical UHV coater with 5 Pocket Linear E Beam Source on convenient slide mechanism for loading and service. 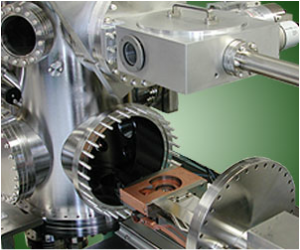 System also features turbo-pumped vacuum load-lock. 22" diameter, 36" high UHV e-beam evaporator with (6) pocket, linear UHV e-beam source, (2) Radak thermal evaporators and turbo-pumped load-lock. 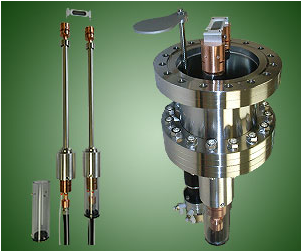 6 pocket rotary e-beam source with load-lock, water-cooled substrate holder, and front side radiant substrate heating. 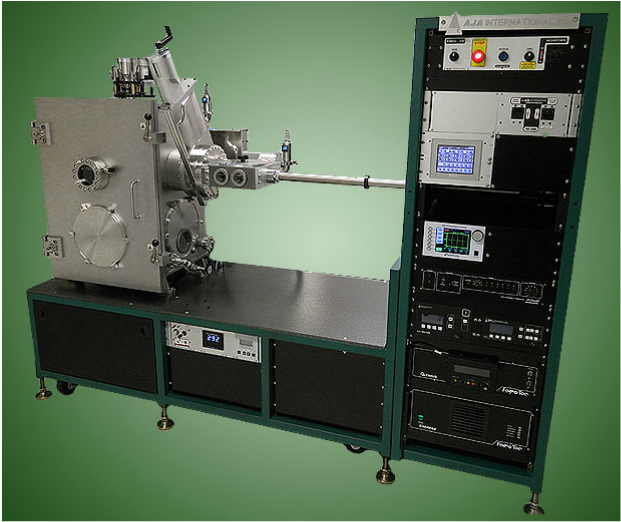 6 pocket rotary e-beam source with 1000°C substrate heating, and programmable linear substrate shutter for wedge films. 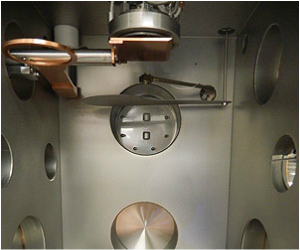 The ATC-E Series Evaporation Systems can be configured for high rate, low rate, multi-layer and co-deposition applications depending on the chamber, sources, substrate carrier and general configuration chosen. Proper power, crucible liner or boat material, soak, and XY sweep decisions must be made for each material to be evaporated to ensure the desired rates, stability and film characteristics. 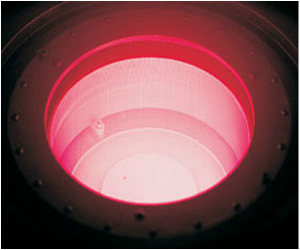 Typically, materials with good heat transfer properties (eg. Al) do not require XY sweep but may require a liner (Au) whereas materials with poor thermal properties (eg. 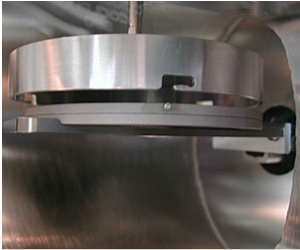 Cr) tend to tunnel and spit unless the e-beam power is diffused with an XY sweep. Proper substrate fixturing is required to obtain the best uniformity. 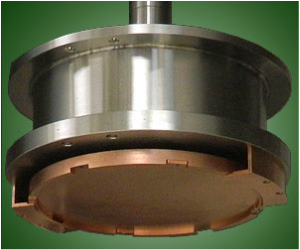 Deposition of SiO2 with XY sweep on 100mm diameter Si wafer with simple, azimuthal rotation, run for 75 seconds at 8450V, 24 mA, 500 mm working distance. Uniformity is +/- 0.7%. 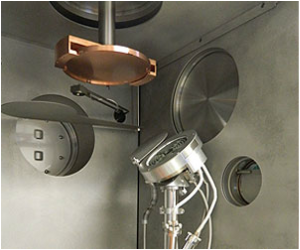 AJA offers a variety of evaporation sources on the ATC-E, ATC Orion-E and ATC 2030/36-E deposition systems. 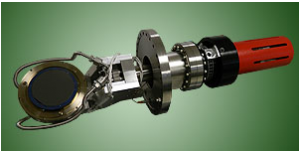 The vertical cylinder ATC-E and ATC Orion-E UHV chambers are best suited for linear, multi-pocket, UHV, e-beam sources which are side mounted and attached to a convenient slide rail for service and loading access. 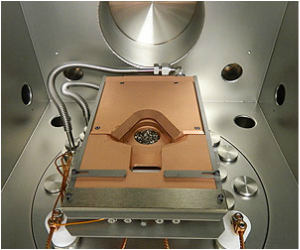 Spare ports on the chamber bottom straddling the linear e-beam source allow for the addition of up to 4 thermal evaporation sources. 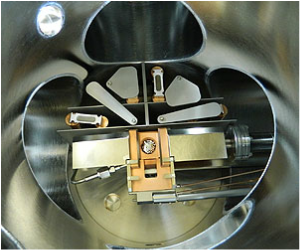 Smaller ATC Orion-TE chambers are ideally suited to multiple, small, thermal evaporation sources (k-cell, resistive boat, Radak, low temp organic) often in combination with magnetron sputter sources. The ATC 2030/36-E HV box coaters with large loading doors are generally fitted with rotary pocket e-beam sources, resistive thermal sources and substrate carriers of all forms - heated, cooled, tilting, planetary, wedge shuttered, etc. Source on easy access slide rail system. 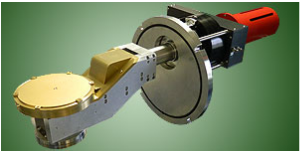 Rotary Pocket HV E-Beam Source with AJA designed, stepper controlled automated indexing. 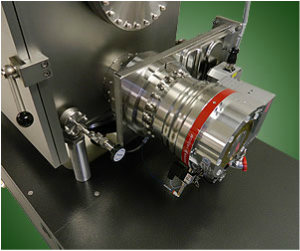 (6) Pocket Linear E-Beam Source integrated with (4) thermal evaporation sources. 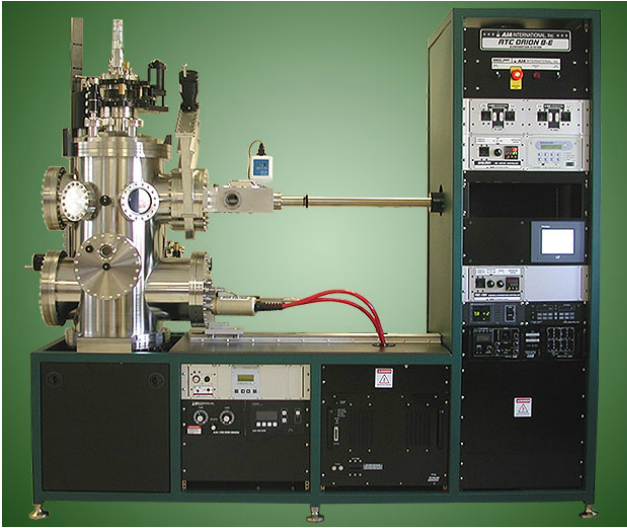 with RF LEIS plasma/ion source. 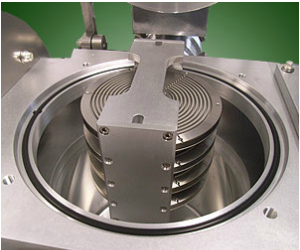 AJA can fit your customized evaporation system with a wide variety of substrate holders including motorized, rotating substrate holders and planetaries to achieve excellent uniformity, heating up to 1000°C, substrate RF and DC bias capability, in-situ manual or motorized Z motion (for working distance adjustment and load-lock transfer) and in-situ mask exchange (available only with certain configurations). 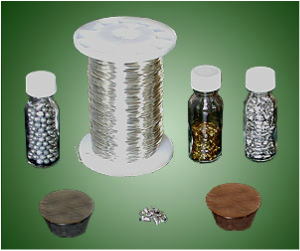 Cooled substrate carriers ( H2O/ LN2) are also available depending on the application requirements. 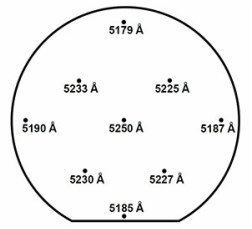 Process gas ring or gas distributor options are offered for reactive processing or applications requiring an anneal step. 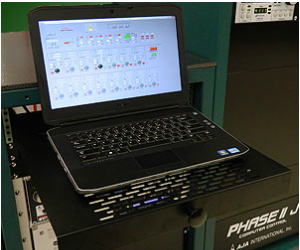 The AJA Labview based Phase II-E computer control system is offered on all ATC-E Series Evaporation Systems. This straightforward, user friendly control system utilizes a large, flat-screen laptop in a 19” rack drawer connected to a single 7” high x 19” wide rack mount hardware module. 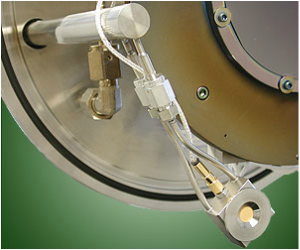 The back panel of the hardware module is populated with connectors to interface to all aspects of the sputtering system. The Phase II-E control system allows the user to operate in either the “manual mode” or the “automated processing mode.” In the “automated processing mode”. the user designs process “layers” which are then compiled and saved as a “process”. The system allows 10 unique user entry points which are accessible only by password, limiting access to a user’s layers and preventing unexpected corruption of a user’s saved processes. 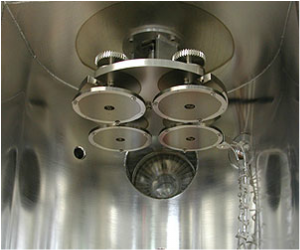 The standard Phase II-E control system will accommodate up to (2) e-beam sources, (4) thermal sources, (1) ion source or (1) RF bias supply, (3) process gases, (2) thickness monitors, (6) shutters, closed loop automatic pressure control if required and substrate temperature control and motion. Processes are aborted if proper feedback is not detected. Special “soak layers” can be easily incorporated into the process. Finally, data logging is standard with an adjustable refresh period. Process data can be downloaded to common spreadsheet programs. 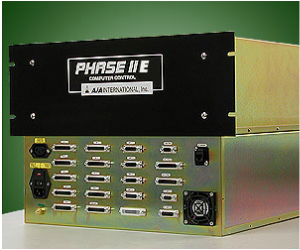 The Phase II E is often linked directly to a deposition controller with multiple QCM heads. 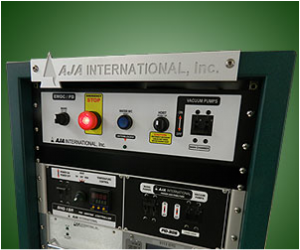 For many e-beam system application, AJA uses the INFICON SQC310 Series deposition controller. 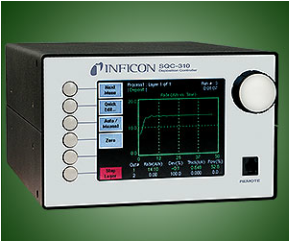 The SQC310 is fully interfaced to control electron beam source indexing, shutter control, and both single and co-evaporation (SQC-310-C) processes. A large on board storage capacity of 100 individual processes and 1,000 layers, enables easy access to recall processes and parameters for sample repeatability. The controller package also includes a Windows program for developing, testing, and downloading processes, and for logging instrument data to a customer’s PC if desired for process analysis and quality control.